Editor-in-Chief Dr. Yanxia Ning, Virginia Commonwealth University, USA. International Journal of Medicine and Pharmacy publishes original scientific studies that have direct clinical significance, and position papers on health care issues, medical education, and public policy. 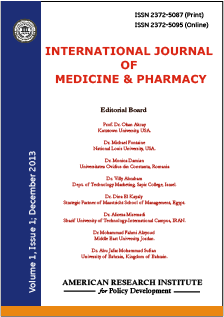 The journal strives to publish the articles related to various disciplines of medicine and pharmacy. Every article published in our journal is promoted to researchers working in the respective fields. All research articles published in the journal have undergone rigorous peer review, based on initial editor screening and anonymized refereeing by at least two anonymous referees. The journal strives to strengthen connections between research and practice, so enhancing professional development and improving practice within the field of pharmacy and medicine. Each paper published in International Journal of Medicine and Pharmacy is assigned a DOI®number, which appears beneath the author's affiliation in the published paper. Click HERE to know what is DOI (Digital Object Identifier)? Click HERE to retrieve Digital Object Identifiers (DOIs) for journal articles, books, and chapters. Dr. Yanxia Ning, Virginia Commonwealth University Medical Center, USA. Dr. Hrvoje Karninčić, University of Split, Croatia. Dr. Belal M. Hijji, University of Benghazi, Benghazi, Libya. Dr. Amir Sadeghi, Hamedan University of Medical Sciences, Iran. Mr. Jesus Alfonso D. Datu, De La Salle University-Manila, Philippines. Mr. Seyed Reza. Alvani, Universiti Sains Malaysia (USM), Malaysia.